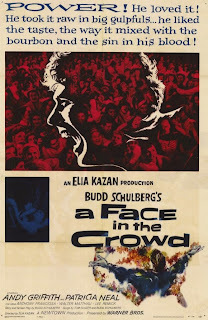 This film was directed by Elia Kazan and written by Budd Schulberg, and it reminds me in places of their earlier collaboration, ON THE WATERFRONT, especially the sense of despair that runs through it. Most of you have probably already seen A FACE IN THE CROWD, but if you haven’t, it’s well worth watching. It’s not what you’d call a likable film, but it is very well done. The only weak spots for me were that Neal's character goes along with the gag as long as she does (but, sadly, her life with Roald Dahl might've informed that as much as iy did her performance in HUD), and the ease of what happens at conclusion. Griffiths was often better than his other scripts. That's an excellent article, Todd. Thanks for the link. Ed, I don't think I've ever seen THE SWEET SMELL OF SUCCESS. I will, though.